Amongst many other things, one that has changed drastically over the last two generations is how kids spend their play time. The toy planes and dolls of our times have been replaced with TV, Internet, Computer games, Video games, Play station, Mobile phones and Tablets. We all agree that kids these days are spending more and more time in front of the screen. So how much screen time is healthy for kids? Infants and kids below 2 years of age should not be exposed to screen media. Children’s brains develop very rapidly during the initial few years. The best way for these kids to learn is by interacting with human beings and not screens. 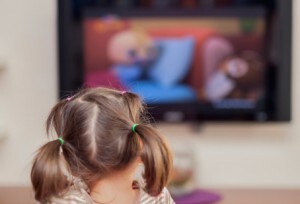 For children above 2 years of age and teenagers, exposure to television and media should not exceed 1 to 2 hours per day. Internet based devices, television sets etc. should not be placed in the child’s bedroom. Instead, parents can watch TV or movies along with their children. This can thus be used as a medium to communicate about family values. Children learn best by imitating. If you are constantly addicted to your mobile phones or television, you will have a tough time convincing your child to stay off the mobile or television. Rather than just limiting the quantity of time that your child spends with mobiles or computers, pay attention to the quality of his/her screen time. Review if the games or apps or serials are age-appropriate and in harmony with your social values. Children will often make mistakes when they are using the media. Handle these occasions with empathy and as teaching opportunities. To create tech free zones, preserve family meal times and recharge your mobile phones or tablets outside your child’s bedroom to ensure healthy eating and sleeping habits. In today’s world, teenagers need to be able to handle online relationships well. Social media does play a part in moulding your teen’s identity. Instead of imposing bans, teach your teens to behave appropriately in the online world. After age 2, the media may be used positively to encourage two- way communications. Thus, instead of passive video presentations, toddlers learn better through media that involve live interactions like a video chat with a travelling parent. Thus, media have become an inevitable part of our children’s growing years. Instead of using the television as a baby sitter that holds your child’s attention while you get some time to do your other work, you can use this screen time for kids constructively.